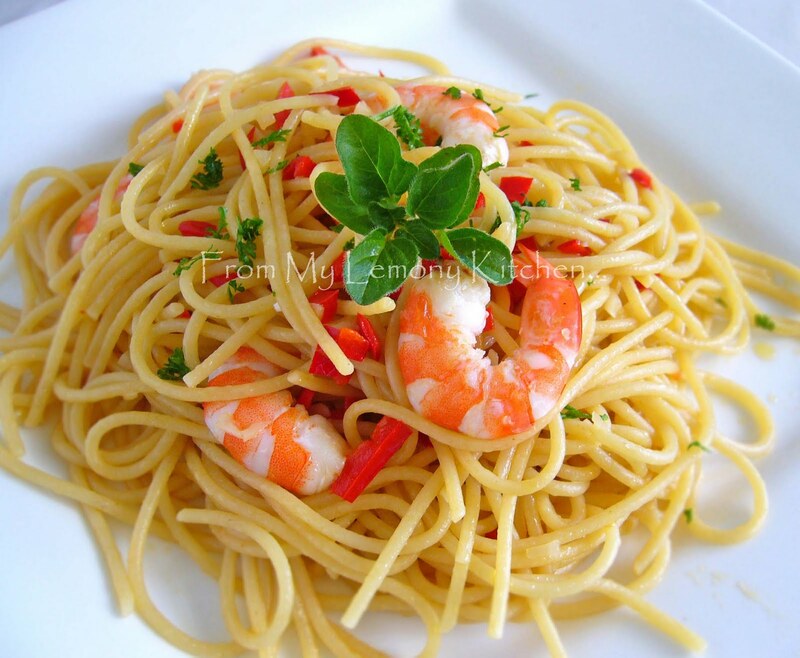 This garlic, chilli and prawn spaghetti, is simple yet refreshing. A meal everyone can enjoy... I can have mine with chillies...and my little Italian girl aka Miss E.. can enjoy her spaghetti... minus the chilli of course!!. Its a win-win situation for us. Cooked spaghetti according to the packet. Drained and reserve about a bowl of the 'pasta' water. Saute the garlic and chilli in a 3 tablespoon of olive oil until fragrant. Stir in the spaghetti with the reserve water. Give a quick toss around the pot or frying pan. And add in prawn, and give it another quick toss.... season with salt and pepper. wow I　come over for the lunch (dinner maybe?)! I love this kind of pasta dish! A glass of Chardonnay or two would make a perfect dinner! Anak2 dara kita sama selera rupanya.. Tp perut Melayu I ttp kheyau nak nasik gak walaupun dah makan pasta-masta ni..
Dah suka sgt, I suruh dia belajaq buat sendiri!! tak tau la mai mana..ke-'Italian'en depa no...kita ni kalau tak pekena cabai dan belacan... tak senang hidup..hehehe. I love the simple, clean taste of pasta cooked this way too, esp with garlic and chillies.